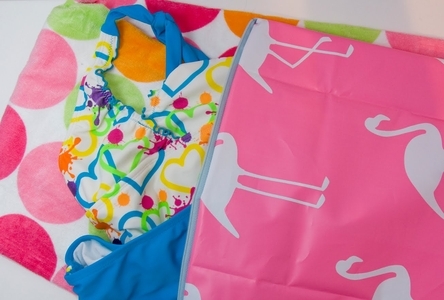 Other ideas for stuff you can make with shower curtains: diaper changing pads, oversized totes for workout, pool or beach, waterproof fitted sheets for a crib. Consider using shower curtain material for any project that would benefit from being waterproof. Don’t forget you can reuse your old shower curtains too. Just toss them in the washer with a teeny bit of bleach and allow them to dry before you cut into them. Heather! This is brilliant! Such a simple idea to use shower curtains in all these great ways. Perfect for making pouches for “wet” things or anything else you mentioned. I have to noodle on this one a bit! Am very excited by the prospects! I have a Graphted Craft Robo( not susre that the difference is between that and the Silhouette) and I love it! I jsut didi a project with it and a dollar tree floating frame. you can check it out here when you have a minute! As for the waterproof fitted sheets for a crib; only make these with material you can breathe through when you put it in front of your face. Personally I wouldn’t use a shower curtain I think. Maybe just for a sheet that covers a small part of the bed or if iss underneath a few layers of normal sheet.